Those who work on a computer perform on average between 50,000 to 200,000 keystrokes every day. Frequent computer use that involves bad posture, repetition or forceful exertions can lead to nerve, muscle, and tendon or ligament damage. 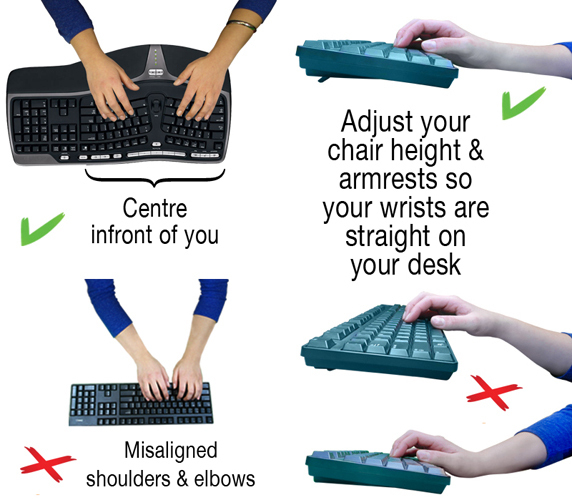 If you use a computer for several hours a day, it is important you set up your workstation correctly and implement proper posture techniques to minimise your risk of harming your hands, arms, shoulders, neck and back. Injuries as a result from overuse develop gradually, but can occur more quickly if you spend many hours sitting at a computer either at home or at work. 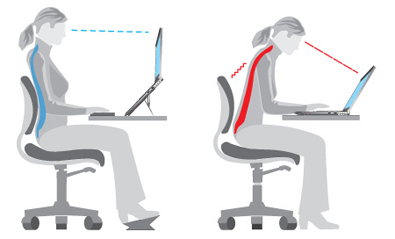 Wearing the Posture Medic can help to stabilise your back when sitting at a computer for over 20 minutes a time. Poor posture is to blame for 40% of workplace compensation costs. The best position for sitting at a desk is to lean back by 135 degrees so as to minimise lower back pain. When wearing posture aids while sitting, people get more restless ant tend to move more, increasing the circulation. Back pain can also be avoided by doing pushups on regural basis. It’s a fact that working at a workstation that is properly set up for your needs and fits your size helps you to work more efficiently and productively. It will also ensure you work in a neutral position that doesn’t put any undue stressor pressure on the body. 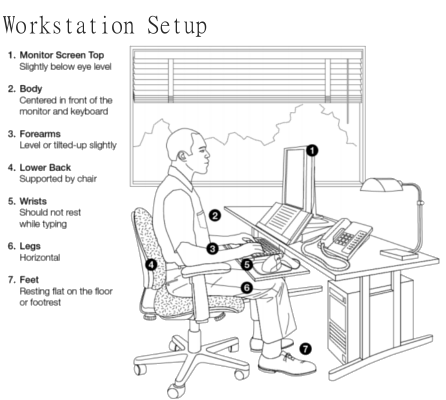 A workstation that has been inadequately set up forces the body to work in uncomfortable, unnatural positions such as slouching, hunching and twisting which can lead to injury. Your desk chair must be one that is sturdy, adjustable and tilts. A chair with a lumbar support is desirable but support can be bought and added on to the chair to help support the curve of the lower back (lumbar region). Do not be tempted to lean forward in your chair when you use your computer. Your thighs should be horizontal with your knees at the same level as your hips and your feet should be rested comfortably on the floor or a footrest. When the height of a desk is at elbow level when sitting, this suits the majority of people. There should be enough room between the desk and your knees and thighs; they should not be squashed. You should consider having the height of the surface holding your keyboard or mouse about 1 to 2 inches above your thighs and centre the keyboard in front of your body. Your elbows stay near your body at an open angle which allows blood flow to the lower arms and hands. Your arms will be virtually perpendicular to the floor. Your wrists are almost straight. 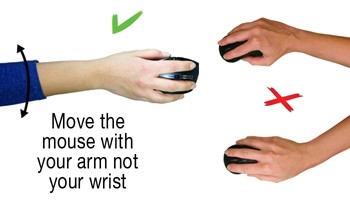 You will feel more comfortable using your arm to move the mouse as opposed to just your wrists. 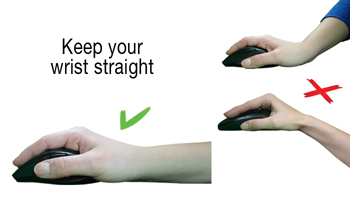 Make sure the mouse fits easily in your hand and is as flat as possible to minimise any wrist strain. It also makes it easier for you to read the monitor, preventing eye strain as well as neck and shoulder fatigue by keeping your head and neck as straight as possible. 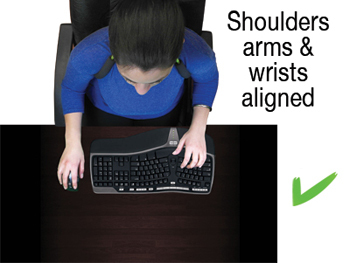 Wearing the Posture Medic will help you to maintain an upright posture when looking at the screen and working. The monitor should be positioned about 20 to 26 inches in front of your head, with the top of the viewing screen at eye level so you do not have to look up or down. If you need access to documents, place a document holder between the monitor and keyboard or to the side of the monitor to avoid twisting your neck or body to reach material. Set up your workstation away from sources of glare or bright light such as windows. Wrists: Hands are in straight lines with the arms lower. Wearing the Posture Medic at work helps to keep your head, neck and shoulders in perfect and natural alignment and prevents any long-term injuries from developing. 45% of people experience neck pain. Lower back pain is the leading cause of disability across the globe. North Americans spend at least $50 billion on back pain every year. The human brain requires 20% of the body’s oxygen. Don’t rest your elbows on hard surfaces. Rest your eyes by focusing on distant objects (i.e., look out a window). Stand up and stretch arms over your head while you lean to each side. Tilt your head to the side, ear to shoulder and hold. Relax and then repeat on the other side. Bring your shoulders up to your ears and hold for a few seconds before letting go. Repeat. Hold one arm out straight in front of you, pull the hand backwards with the other one and then pull downward. Hold, relax and then repeat with the other arm. 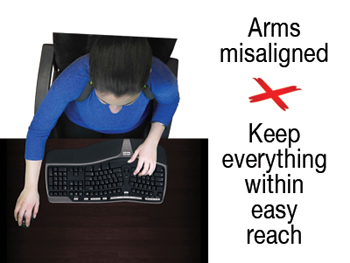 Using a laptop does not always allow for the correct posture to be held because the screen and keyboard are not separate. When using a laptop, we often hold our hands and wrists in the wrong position and often bend our head and neck to see the screen. If you use a laptop daily, consider buying an external monitor or get a stand to view the screen at the correct height and type using an external keyboard. If using a laptop occasionally, you can use the computer in your lap which provides neutral wrist posture. Take regular breaks and stretch your neck and shoulders to prevent them going stiff. 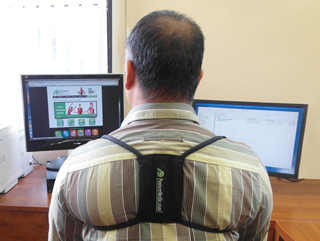 Wearing the Posture Medic each time you work helps you maintain correct posture.